During a home remodel, walls can be stripped down to the studs or even taken out completely. Wiring moved, plumbing upgraded, and so on. But where a remodeler really makes their mark is how they put it all back together again. Yes, how a home is wired, plumbed, or even framed out is important – but all of that stuff is hidden behind the drywall. It’s the custom woodworking, cabinetry, and room design that really makes the new living area shine. Designers Northwest, Inc., has a team of highly skilled carpenters – some of which have been in the business for three or four generations. Their craftsmanship comes through in every design we do. Below are a few examples of our work, creating pieces that match the design of the room. This mantle was made in the Designers Northwest, Inc., shop a few years ago, using distressed alder. 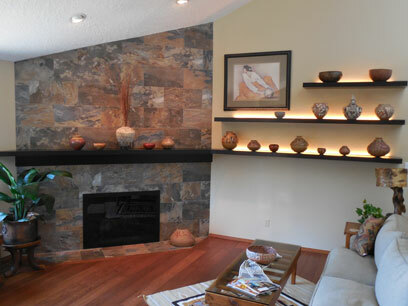 The mantle really completes the fireplace and provides extra space to display art and pictures. 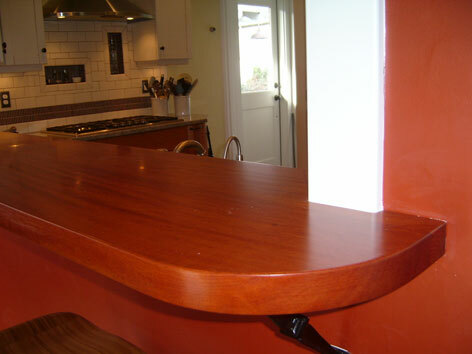 A bartop was needed for this kitchen redesign, so we built this Brazillian cherry bartop to complete the look. Along with the steel brackets, everything was made in house. Designers Northwest, Inc., also designs and creates sleek display units, like this shelving system. Incorporated seamlessly into the mantle, custom steel brackets were fabricated in house and installed in the exposed walls. The walls were finished off, the shelves installed, and LED lighting added to create an ambient atmosphere in the living area. Custom cabinetry and millwork solutions like these and many more can all be created to complete the perfect look for your remodel. 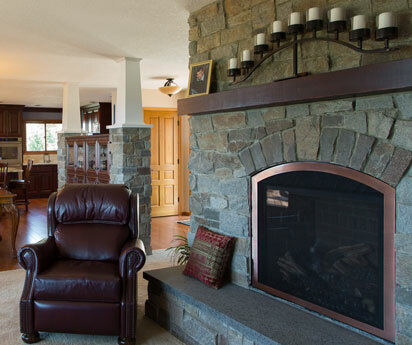 Contact Designers Northwest, Inc., today to discuss your home remodeling needs. Or fill out our survey to give us a better understanding of what you want to do.